The Mercedes-Benz AMG models have the superb reputation of the luxury sports utility vehicle with grand styling features and high-performance factors. The Mercedes-Benz AMG GLC 43 Coupe exteriors feature the AMG body styling with diamond pattern grille LED intelligent light system, and electrically folding ORVMs. The interiors aesthetics are highlighted with ARTICO man-made leather upholstery, AMG instrument cluster with 5.5” multifunction display and sunroof with electric adjust. The dynamic select feature with five mode selection, speed sensitive steering, and the safety features of seven airbags and Parktronic park assist system are featured as a standard. Aside from the prominent sloping roofline, the Coupe 43 looks decidedly sportier than the standard GLC SUV with a chrome-pinned diamond radiator grille, twin louvred air intakes and a chrome splitter running across the lower edge of the front bumper that channels air flow for better cooling. The sporty bits continue on the sides with twin five-spoke alloys and what is now Mercedes’ signature coupé rear – narrow horizontally oriented split tail-lights, a centrally positioned three-pointed star and a sharp spoiler lip. The exhausts are four-pipe chrome tipped units. Should you still be in doubt, the Coupe 43 gets ‘AMG’ lettering on the front grille and boot lid, AMG-badged wheel center hubs and ‘Bi-Turbo 4-Matic’ lettering on its flanks. On the whole, the SUV-coupé does a good job of looking sporty with very little visual bulk and flab thanks to its taut and tucked in lines. The athletic stance of the coupe is further accentuated with a length that’s stretched out by around 80mm and a height dropped by 40mm compared to its SUV counterpart. On the inside, you’ll find the same general appearance is shared between the GLC Coupe and the GLC43. Big things sometimes come in little packages, though, and that’s the case with the interior of the GLC43. To start off, AMG threw in a set of front sport seats that come with increased lateral support to help keep you in place during more extreme maneuvers. The entire interior is upholstered in black MB-Tex/DINAMICA microfiber that is held together by red contrast top stitching. Believe it or not, the stitching adds to the overall ambiance and luxuriousness of the cabin. You’ll find AMG tossed out the white inserts from the center of the seats and the door trim panels and went with the black DINAMICA instead. The silver inserts on the door panels, the face of the dash, and in the middle of the center console carry over from the standard GLC Coupe. There is a new carbon fiber insert that covers the majority of the center console, which is a nice addition. As far as infotainment goes, the car comes standard with an Audio 20 system with a 7-inch touchscreen display, Frontbass, Bluetooth connectivity with audio streaming, and two USB ports. Garmin Map Pilot comes as optional equipment to create a “full-fledged navigation system.” Maps for the Garmin system are supplied via an SD card. Opting for the Comand system, the media display is replaced by an 8.4-inch unit and includes hard-disc-based navigation, live traffic information, and can be optioned with a WiFi hotspot and advanced voice control system. A Burmester Surround system is available as an option and includes a nine-channel DSP amplifier, 13 speakers, and an overall output of 590 Watts. Not bad, but surely, you’ll have to pony up some extra cash for this luxury. Powered by the AMG 43 series V6, the Coupe 43 puts out 367hp at 5,500-6,000rpm and makes 520Nm of torque between 2,500 and 4500rpm. These values are identical to that of the larger GLE Coupe and it does the 0-100kph sprint in a claimed 4.9sec, about a second quicker than the GLE’s 5.7sec. The car feels quick and sounds so too. Even in Comfort mode, there is a hint of a rumble and murmur, and Sport and Sport+ modes bring these gloriously to the forefront. It’s no V8, but the soundtrack is exciting enough and Sport+ mode brings along some neat pops and cracks from the exhaust when you lift off. ‘Sport’ is best for some spirited driving and while Sport+ mode may be the most dramatic, it’s also quite hard-edged with an aggressive throttle setting; it would be best to use this when you have the road all to yourself. The car also has an Eco mode and I did try this out for sometime. Being an AMG, it does not feel as lethargic as some of the regular Merc cars, but the throttle does get heavy and my guess is you’d only use it if you were running low on fuel and struggling to reach a pump. The high power output and torques with AMG performance 4MATIC technology with two-stage AMG speed-sensitive sports steering and the steering mounted controls enhance super smooth drivability of the vehicle. The AMG dynamic drive selector with five mode select feature enables the driver to choose between comfortable, sporty, particularly sporty or efficient drive styles and individual drive modes suiting the driving conditions and speed and torque requirement. The drive quality improved with suspension system featuring continuously adjustable damping deliver a high standard of driving dynamics. 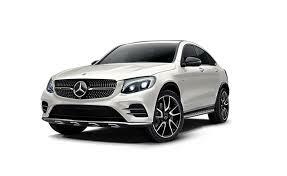 You could consider me as one of those people who thinks that the GLC Coupe, in any form, is a little pointless. Merc has crammed a Coupe body onto an SUV chassis and has tried to mix the dynamics of a coupe with the off-road abilities of an SUV. The problem is, I don’t see this thing really being all that dynamic. Sitting so high, it’s still a little top heavy, which will make maneuvering at higher speeds difficult – something you don’t want in a sport coupe – while it doesn’t sit high enough to really be considered for off-road use, regardless of what Mercedes claims. I do like the interior and that the GLC43 features a decent uptick in power and performance, but a vehicle like this really seems like the red-headed stepchild of Mercedes entire lineup.